Five hundred years ago, there existed a library like no other — thousands of volumes collected from around the world by the son of explorer Christopher Columbus. Five hundred years ago, there existed a library like no other — thousands of volumes collected from around the world by the son of colonial explorer Christopher Columbus. Only a quarter of that collection survives today, housed in Spain's Seville Cathedral. 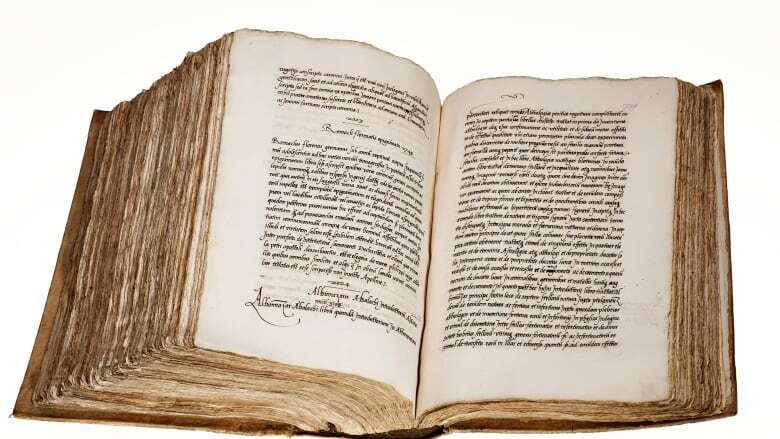 However, one the library's most important books — the Libro de los Epítomes — has been unearthed at the University of Copenhagen. It's a 2,000-page, hand-written index summarizing all 15,000 volumes in the original collection. "It's an extraordinary object," Edward Wilson-Lee, a literature professor at Sidney Sussex College in Cambridge, U.K., told As It Happens host Carol Off. "What's really exciting about this is that many of these books are probably existing in no other form than in this manuscript that's been discovered." Wilson-Lee is the author of The Catalogue of Shipwrecked Books, a biography of Hernando Colón, Columbus' son who was born out of wedlock and therefore considered illegitimate. "He was trying to prove himself his father's legitimate spiritual heir even if he wasn't his father's legitimate son by building a universal library which had every book in the world in it," Wilson-Lee said. "He personally went around and bought books on these extraordinary book shopping sprees where he was purchasing thousands of titles at a time." Colón never did manage to find every book in the world, but the massive international collection provides a snapshot of what people were reading during the early ages of the printing press. "How print really revolutionized the world was by making it possible to distribute cheap print — you know, information in news sheets and popular ballads and erotica and weather forecasts and things like that," Wilson-Lee said. "But no one at the time actually thought of collecting this stuff." After Colón died, much of his collection, like a lot of literature from that era, was lost to the ravages of time. "He passed it on to his descendants who didn't really recognize the worth of what they had, in part because Hernando's visionary move was to collect everything — and I mean everything," Wilson-Lee said. "Kind of like early websites or early Hollywood movies, people didn't think of it as, you know, an elite cultural form. So no one bothered to collect it or note down apart from Hernando, who had this extraordinary insight into the way in which print was going to change the world." Colón's collection bounced around from place to place until it ended up in the Seville Cathedral, where much of it was stolen, including the Libro de losEpítomes. The book, more than a foot thick, was discovered recently in the Arnamagnæan Institute, a collection of books donated by Icelandic scholar Árni Magnússon to the University of Copenhagen upon his death in 1730. There it sat, largely untouched, until Guy Lazure at the University of Windsor in Ontario found it and made the connection to Colón. The Institute flagged it to the Metropolitan Museum of Art, which contacted Wilson-Lee and his colleague José María Pérez Fernández to verify its authenticity. Wilson-Lee and Fernández are planning to publish a thorough account of the manuscript's contents, as well as helping the university to digitize it. "It hasn't been seen for at least 400, if not close to 500 years, and so the assumption had to be that it was lost," Wilson-Lee said. "Over 500 years [for] something like this to survive is pretty extraordinary." Written by Ashley Mak and Sheena Goodyear. Interview with Edward Wilson-Lee produced by Ashley Mak.